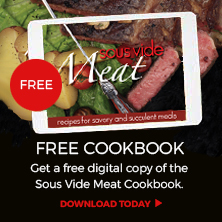 This week I made vegetables confit in my SousVide Supreme, and they were an absolute hit. I cooked pearl onions, mini peppers and garlic. They were incredibly sweet, succulent and intensely flavored. The vegetables retained their shape beautifully, while still being perfectly cooked. Cooking confit means to cook in oil and it’s one of the oldest methods there is to preserve food. Most people associate confit with meat, such as duck confit. However, vegetables are equally delicious when cooked confit. The exact temperature control of the SousVide Supreme allows me to cook the vegetables slowly at a precise temperature to ensure the vegetables maintain their shape and develop intense and complex flavors in the cooking process. Garlic confit is so sweet and soft and is great to have on hand in the fridge. It can be added to pasta sauces, mayonnaise, or dressings to give them an extra oomph. Pearl onions confit are amazing in sandwiches or on top of burgers. Baby peppers confit are delicious in salads, with pasta dishes or as antipasto. I usually like to cook each vegetable separately, so I can use them in different ways; however, if you wanted to cook them all in one pouch, that would be fine as well. 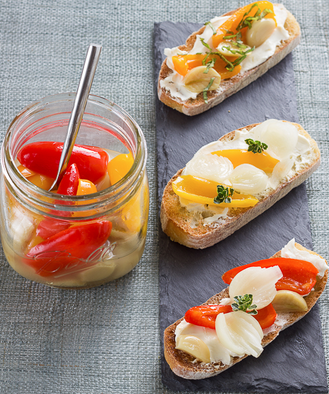 For this recipe, I combined the vegetables confit and served them with some toasted ciabatta, goat’s cheese and herbs. It makes for a simple and delectable summer starter. Put the peeled garlic cloves into a (quart/0.95 liter) zip-closure cooking pouch. A baggy rack helps in filling the pouches easily. Pour ¾ a cup (177ml) of the oil on top of the garlic cloves. Essentially you want the oil to completely cover them. Use the displacement method (Archimedes’ principle) to remove the air and zip the seal closed. Do the exact same steps for the peeled onions and mini pepper halves. For the mini peppers, you will need about 1 and ½ cups (355ml) of the oil to completely cover them. Once all three pouches are zipped closed, submerge them in the preheated water bath and leave to cook for 1 hour and thirty minutes. When the vegetables are cooked, quick chill the pouches in a basin of ice cold water for thirty minutes. 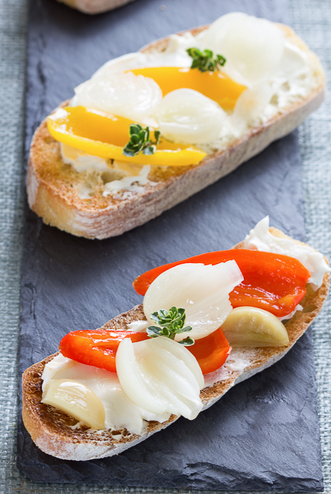 For this recipe I served the vegetable confit with toasted bruschetta and spreadable goat cheese. Brush some slices of ciabatta bread with a little of the oil from the confit garlic and season with salt. Toast the ciabatta slices under the broiler, until golden brown. Spread the goat cheese onto the ciabatta toasts. Top with the vegetable confit and a sprig of thyme or some chopped basil.